As you realized through these last years, I've not been updating my website. 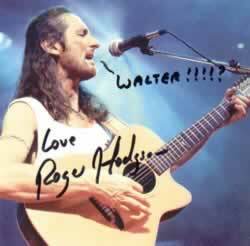 But now, after a long search for a new "webmaster", I finally met the perfect person to "recreate" the "Supertramp & Roger Hodgson Brazilian Fan Club". He will be also teaching me the "difficult" art of keeping the website updated. Roger Hodgson will play one concert at “São Paulo Moto Festival” ( www.spmf.com.br ) and probably another one in Rio de Janeiro or Brasília ! 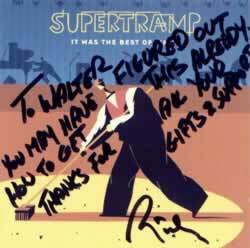 For all SUPERTRAMP & ROGER HODGSON FANS... Join us at ORKUT… Our communities have more than 1,400 fans and the topics are always very interesting ! EXTRA! EXTRA! EXTRA! NEWS FROM SPAIN! Walter called today from Barcelona to say that Sir. John Helliwell is now a grandfather! John declared, 30 minutes before the show, that his son Charles called from New Zealand to announce that he just a had a baby boy. John was very much applauded by more than 15000 people! As the spanish fans said: � Enhorabuena, "abuelo"! Brazilian fans now can buy the album "Slow Motion" on Submarino Virtual Store. Click here to see the product details and buy the CD. Today I'm going to Spain to attend the concerts in Malaga, Granada, Madrid and Barcelona. Be home next week! Some minutes ago my dear friends Jose Antonio and Jordi called me again using their celular phones (after calling me a lot of times during the whole concert) to talk about the first concert... in Benidorm - Spain. They were really very excited !!! They said that the concert was really TERRIFIC !!! And with some wonderful surprises. They said that one of the highlights was GIVE A LITTLE BIT... And you will say... with Mark Hart ??? They just said that Jesse played the accoustic guitar and sang the song very very well ! Wanna ask the band a question? I'll choose some of the fans' questions and try to interview them in Spain to record some of the answers. Click on the caricature below to send your question. Happy birthday to us! Happy birthday to us! Happy birthday, dear Carl Verheyen and me! Happy birthday to us ! Today is Dougie's birthday ! Hope our dear bass player has a wonderful day with his family and friends. Happy 51 ! 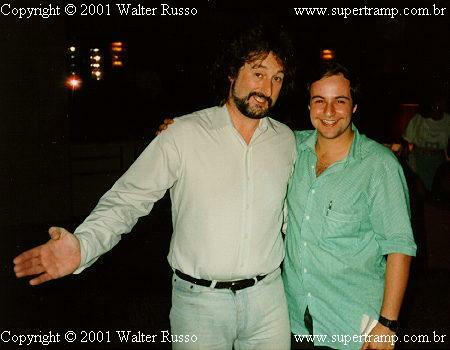 Click on the disc and read the official press release of Supertramp's first DVD "The Story So Far..."
Our dear and beloved Roger is now 52. Happy birthday from all your fans! We love you and miss you very much! I'm creating the new link "INTERVIEWS". You can go there and check a very interesting audio interview with Rick, John and Mark during the release of "It Was The Best Of Times". Now it is confirmed that I'm going to Spain to attend four concerts between April 25th and April 28th. I'm also going to Europe in July for the German and British concerts. Last tuesday (february 26th) I received my copy of the new album SLOW MOTION. It's simply fantastic !!! In my opinion the best Supertramp album since Roger left and one of the best of their whole career ! I'm writing the press-release for EMI Brasil, and in a few days you will be able to read both press-release and my review ! Just wait ! Message from Mr. John Helliwell. John spent his birthday (Feb 15th) in New Zealand, where his son Charles got married. Our beloved John sent an e-mail thanking us for our birthday messages to him. Read it here. EMI Brazil annouced the release (only for radios) of the first single from the new album "Slow Motion". They also informed that the CD will be released simultaneously in Brazil and in Europe (March, 25th). End of suspense: The DVD "THE STORY SO FAR..." will be released next march in the USA. You can order it through CdNow. You can also read what they wrote about the DVD. "SLOW MOTION" cover is now available !!! Happy Birthday John! Your fans hope to be wishing you congratulations for decades! You can read some of your birthday messages here. Check the track list of the new album "Slow Motion". WISH LIST RESULTS. The final results of the wish list are now available. You can see the 16 most voted songs and all the statistics. EXTRA, EXTRA !!! 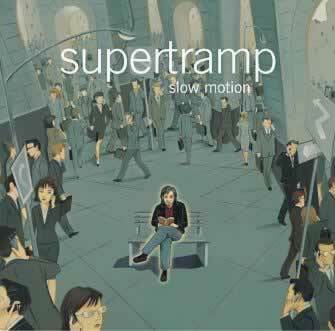 The new Supertramp album "SLOW MOTION" will be released March, 25th. Rick and John announced the name of the new album during a press conference yesterday in Madrid. Listen to the single "Slow Motion". BIRTHDAY MESSAGE. Next February 15th, Sir John Helliwell will turn 57. Wanna send him a message ? Merry Christmas to you all ! Carl, Bob, John, Mark, Cliff and Jesse sent holiday messages. Hope you like them ! WISH LIST. Wanna join us in this new project ? Just click on Rick's animation and tell him your wish list for the "One More for The Road" tour! "Sir" John Helliwell sent a very beautiful Christmas Card. Have you got Mark's new album "Nada Sonata" ??? If you buy it (you have to !!! ), PLEASE, pay a special attention to songs like: "Something To Take My Mind Off of You", "I've Got A Girl", "To Paris", "Many Roads" (FANTASTIC !!! ), "Time Bomb Man", "Nada Sonata" (FANTASTIC !!! - Very good for radios !!!) and "Lullaby for Channing" (A beautiful song... full of feelings... very touching !!!). You can order it direct through PSB Records. Carl Verheyen is releasing "Solo Guitar Improvisations" . I don't have it yet, but his other albums are really very good. You can order the new cd and his older ones just clicking here. No more rumours: Supertramp new album is confirmed now. It will be released in march/april 2002. The new (and maybe last) tour will have a very interesting name: "One More for the Road". "Supertramp" is a registered trademark of Rick Davies Productions, Inc. All rights reserved. This website was originally designed by Eric "Sthing" Nielsen and Walter Russo.